Velocity Basin in the spring. Mud season – or shoulder season, also known as spring in the San Juans – can last from April all the way through June depending winter snows, spring sun, aspect and elevation. Traditionally a time in southwest Colorado to break out the road bike or to visit Utah, spring can be a great time to get outside on the local public lands. One of the most important things to remember is that not everything is open in the spring. Roads stay closed to protect them from mud and rut damage and some appealing hiking areas stay closed to protect wintering and newborn wildlife. In both cases, please respect the closures. They are in place to protect the resources and little patience goes a long way to making things better and healthier through the summer. It’s hard to predict when the various trails will be snow and mud free. Sunny south facing areas may be clear in April while just around the corner on a shady north aspect there may be snow into June. Be flexible in your planning and be willing to explore and turn back if conditions are unfavorable. The Outdoor Recreation Hotline is posted on the Forest Service website and printed in many local newspapers starting in May and it gives an estimate of the snowline for north and south aspects. You will be able to find it here www.fs.usda.gov/sanjuan or by phone at 247-8187. Usually, the highest elevation passes and trails are clear to easy hiking with minimal or no snow by the last week of June. On a light snow year that date can back up as much as early June. In general, be patient and work your outdoor recreation uphill as the weeks pass. Start down in the desert areas while the temperatures are still cooler. Canyons of the Ancients, Phil’s World and the Dolores River Canyon are good starts locally while many people enjoy Moab and northern New Mexico in the early spring. 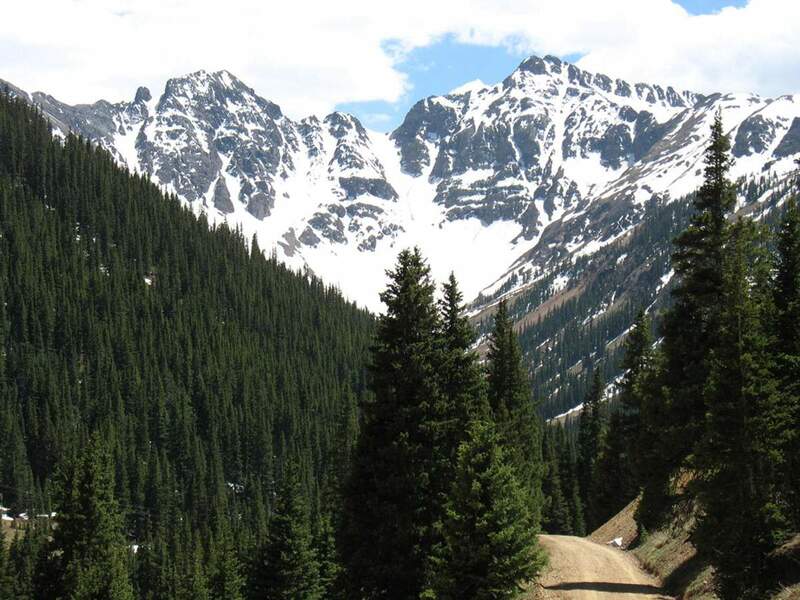 As May comes in and Forest Service roads begin to open, hiking in the Hermosa Creek area, the Piedra Area, the Boggy Draw area, or even the Pine River Trail in the Weminuche Wilderness dry out and become more accessible. When June rolls around, most everything is clear except for the highest peaks and passes. Remember that the Forest Service trail crews are just getting started, so expect downed trees to still be encountered on most trails. Leave the Weminuche, South San Juan, Lizard Head, and Colorado Trail trips for the middle to end of the month. Of course, if you’re on the opposite side and chasing the snow uphill, skiing is still possible throughout mud season. April can be difficult as the snow gets heavy and the danger from wet slide avalanches is possible. But as roads and Passes open up in May, access to the high backcountry gets easier. Get a good four-wheel drive and explore the hike-to ski terrain that is nearby. Memorial Day is a great end to the ski season but most often there is good snow to be found into June for those who are willing to drive a little higher and ski a little steeper.